ANSI and Unicode are two different formats of PST file. If you are using ANSI file format for your Outlook 2000 PST file and now you are planning to upgrade you Outlook version then you also have to upgrade the PST from ANSI to Unicode format as ANSI format is no longer in use after Outlook 2000 version. Unicode is more advanced then ANSI and it offers much more then the ANSI file format. ANSI PST file has limitation such slow performance and less storage space as compare to Unicode format which offer new flexibilities and better performance in regards to email storage. So there are several reason to upgrade your old ANSI PST file to New Unicode format, which allows for up to 65,536 characters. Unicode file format is much more complex then ANSI file format and that’s the reason many OS don’t understand this. But if you talk about Microsoft then Operating Systems like Windows NT / Windows 2000 / Windows XP other new versions supports Unicode formats. ANSI to Unicode Upgrade Solution: Now you can use PST upgrade software solution by our organization to accomplish this task successfully. 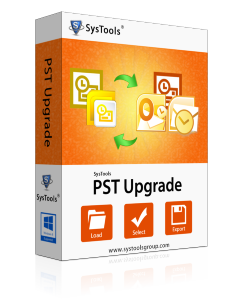 Our PST Upgrade tool successfully migrates all the content from your older ANSI PST to new Unicode PST file. We also offer enterprise migrations of your PST data upgrade in by migrating large number of PST files Unicode PST file formats. Our enterprise solution will certainly save a lot of your time and money as compare to manual migration process of large numbers of PST files.